With the advent of Microsoft Dynamics CRM 2016 online many new features have been incorporated. One such feature that all have been waiting for long is seamless integration of MS CRM with Microsoft Cloud or popularly known as Microsoft Azure. 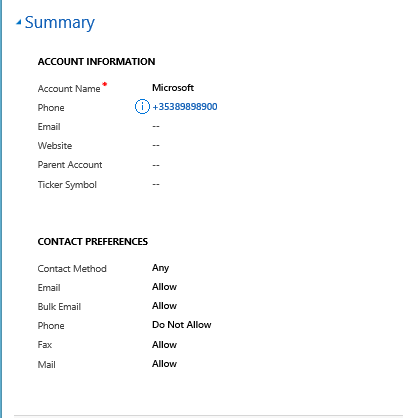 You can connect Microsoft Dynamics CRM Online 2016 Update and Microsoft Dynamics CRM 2016 (on-premises) with the Microsoft Azure platform by coupling the CRM event execution pipeline to the Microsoft Azure Service Bus. Once configured, this connection allows data that’s been processed as part of the current CRM operation to be posted onto the service bus. Microsoft Azure Service Bus solutions that are “CRM-aware” can listen for and read the Microsoft Dynamics CRM data from the service bus. This blog is part of the series which I will use to cover all interesting enhancements coming in Dynamics 365. 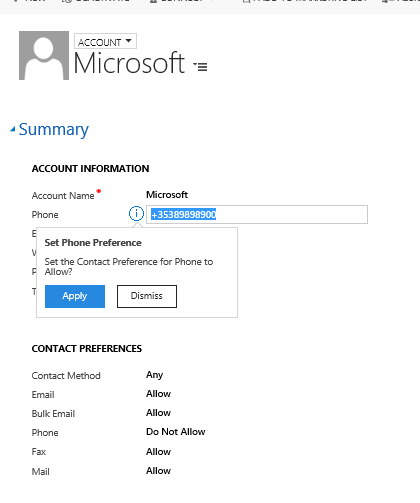 Scenario: On Account form, if user fills in the Telephone field – suggest a recommendation to set Contact preference by Phone field. If user selects yes, set Contact by Phone option to allow. Organization Insights Dashboard in Dynamics 365. Create a new Dashboard and Add Organization Insight Components to it. 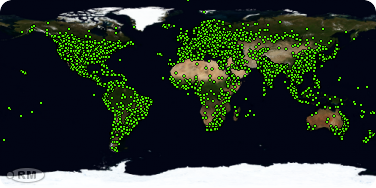 Some more research and yet another blog post to highlight another excellent feature of Dynamics 365. I have been extoling Dynamics 365 and I am tired as the more I explore, the more I get amazed by it. So without wasting much time, let me straight get to the point here. With Dynamics 365, a whole new set of actions has been provided to you OOB. As per MSDN documentation, the following are the new set of actions available with this release. Similar to the apps that we see in Menu Bar for Dynamics 365, we can create our own apps. First we need to enable the Preview for it. It will take us to App Designer, provide details. First we need to configure the SiteMap for the app. Click on arrow inside Sitemap area to configure. Update properties of Area, Group and Subarea and add new Sub Areas. Different Types of Sub Area can be defined. It has added Dashboard along with Contact and Lead Entity View. Now let us add Form and Views to Contact and Lead Entity View using Entity assets. Repeat the same steps for Lead entity. We can specify specific roles which could access the apps. In Dynamics 365 we have new visual designer for Business Rules (and Business Process Flows). Conditions and Action can be copied, cut. delete and pasted in designer window. May be in future release we’d have that feature as well. Quick Walkthrough – Editable Grid in Dynamics 365. Save and Publish the change. We can add JScript for fields inside grid. Author Nishant RanaPosted on November 1, 2016 November 3, 2016 Categories CRM, CRM 2016, Dynamics 365, Microsoft Dynamics 365, Microsoft Dynamics CRMTags CRM, CRM 2016, CRM 2016 Update 1, Dynamics 365, Microsoft Dynamics 365, Microsoft Dynamics CRM3 Comments on Quick Walkthrough – Editable Grid in Dynamics 365.